A Wiggles wedding! Congrats Emma and Lachy! 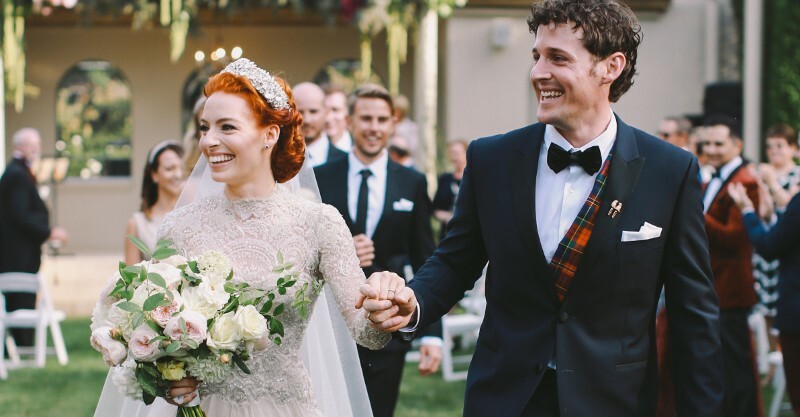 There were no yellow or purple skivvies in sight when Emma Watkins married Lachlan Gillespie in a very wiggly wedding at Hopewood House in Bowral yesterday, with the bride describing her big day as the best day of her life. Yellow Wiggle Emma looked every bit the beautiful bride when she married Purple Wiggle Lachy in front of 200 family and friends, including their Wiggles bandmates Anthony and Simon. Posting a picture of the happy couple, The Wiggles’ Instagram page was flooded with messages of congratulations this morning. “Lachy. Love. Laughter. The best day of my life,” said Emma in a statement. Both Emma’s and Lachy’s wedding rings have Emma’s signature bow engraved and each are set with nine rubies, to signify the date of their wedding, April 9. We are so thrilled to announce, that Emma and Lachy were married yesterday in a beautiful and intimate ceremony surrounded by close friends and family. It was an incredible day and we know Emma and Lachy can’t wait to share more with you soon. A big congratulations to the newlyweds from the entire Wiggles family. “We are so thrilled to announce, that Emma and Lachy were married yesterday in a beautiful and intimate ceremony surrounded by close friends and family”, the pic’s caption reads. Emma wore an ivory gown by Australian designer Suzanne Harward for the ceremony in the NSW Southern Highlands, topped off by a headpiece from Viktoria Novak. Lachy looked dashing with a tartan sash under his suit. “Seeing Emma was the most magical moment of my life. Everything else just seemed to melt away,” said the groom. Red Wiggle Simon Pryce was one of Lachy’s six groomsmen. 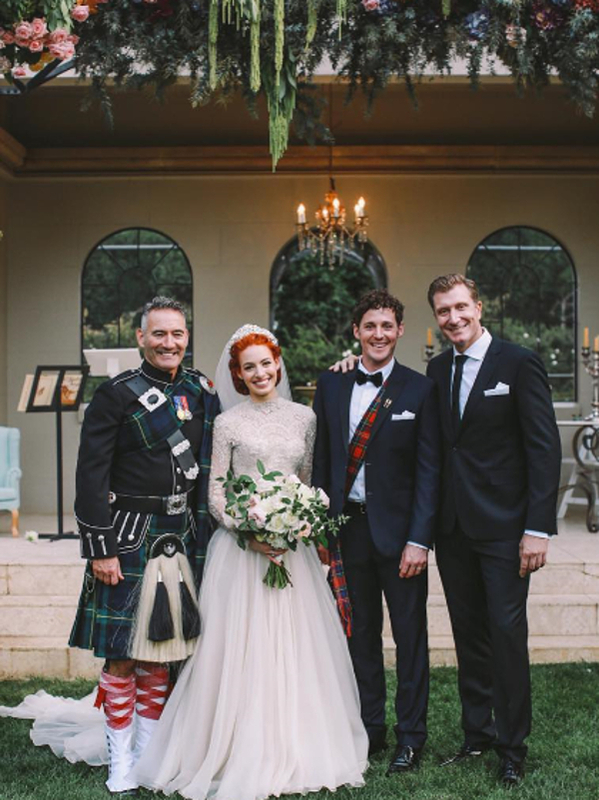 Along with other bagpipers from his regiment from his army days, Blue Wiggle Anthony Field wore a full regimental highland bagpiping uniform to play the bagpipes for Emma as she arrived and again when Emma, Lachy and the bridal party left the ceremony. The wedding cake had a bow made from icing and was iced in pale yellow and purple as a nod to their Wiggles costumes. The performers announced their engagement a year ago. Lachy proposed to Emma at Lavender Bay on Sydney Harbour, getting down on one knee to read a poem.